1. WEAR YOUR HOODIE ON WEDNESDAY 3/21 (Tomorrow) and upload a pic to Twitter, Facebook or Instagram with the hashtag #millionhoodies. 2. SIGN THE CHANGE.ORG PETITION – started by Trayvon’s parents. Currently over 530,000 signatures, we can move the needle to 1 million this week! 3. 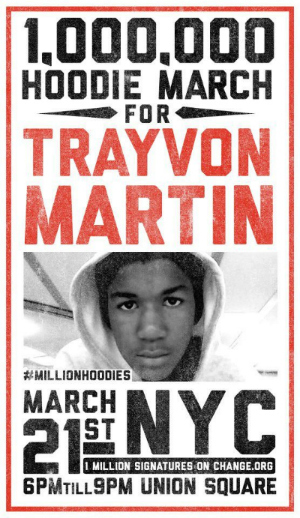 JOIN US IN NYC – Throw on your hoodies and come gather in Union Square to show your support for justice for Trayvon Martin! I will be in attendance with my org….Let’s fight for justice NYC let’s do it all for the trayvon’s out there. I live fifteen minutes from Sanford FL. I have been in and out of that city for eight years now. So of course this hit close to home(literally). As a mother, and as a African American, this is devastating. Justice needs to be served! Every parent in this country or any other country who knows about this tragedy should want justice to be served! This isnt only about discrimination, this was a child. Can we protect and support our children?! YES!!!! I felt the love tonight in Union Sq! Thank you for posting. The power of social media, blogs, etc on a matter like this remind me that despite all the craziness in the world, there are more of us who care for each other than not. hope that everyone knows that the issue is racial and not the hoodie.